Most of what we know today of wearing corsets, bustles, petticoats, and trained skirts, we learned from films or television. Heroines like Scarlet O’Hara and Elizabeth Swann have taught us that corsets must be tight and uncomfortable, and all that petticoats are good for is tearing up to make bandages. Like much of what Hollywood portrays, I suspected that their version of Victorian life had to be, at the very least, exaggerated. 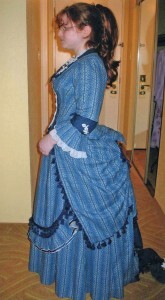 So, when I had the rare opportunity to dress up in full Victorian costume and go out on the town, I jumped at the chance. I drove several hours to the city of St. Louis, MO and there began the transformation. I’d dressed up in Victorian garb before, but my costume was incomplete, then, and short-lived. On my way to the event, I was caught in a torrential downpour which ruined my carefully put-together costume. I arrived a soggy, bedraggled, ruined mess. This day, however, was sunny and clear, with no sign of inclement weather. In fact, this event took place in late summer and we would have no air conditioning. I’d heard people say that they would simply die wearing so many layers on a hot day, and I’d heard the rebuttal that since the layers are of natural fabrics you’ll actually stay cooler than you would in shorts and a t-shirt. Now I could test this for myself. I chose to wear the dress I’d made as a replica of Christine’s “Wishing” Gown from Andrew Lloyd Webber’s Broadway show The Phantom of the Opera. 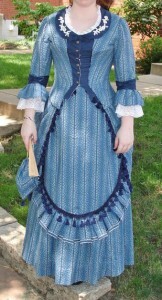 In addition to being a close copy of the stage costume, I made it an historically faithful dress from the mid-1870s. I knew it would work well for this experience. Underneath, I wore a combination undergarment, a steel-boned corset, three petticoats, and a wire bustle. One of my petticoats was an actual garment from the 1890s, a pristine example of the workmanship of the time. (For more information on the antique petticoat, please see the article: Two Antique Petticoats) I wore thin, above-the-knee socks that are similar in weight to period stockings, and a pair of shoes that are much like those found in fashion magazines of the late 1800s. For the first time, I had someone to help me get dressed, and I learned that, while it’s entirely possible to dress yourself, it’s also much easier with a companion who knows what they’re doing. I slipped on my stockings and shoes, then buttoned myself into a combination. 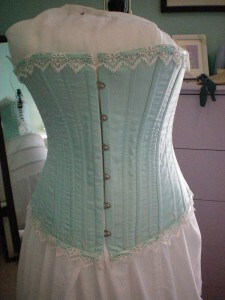 My friend—for the sake of privacy, let’s call her Em—turned me around and laced me into my corset. My first thought, as she tugged and pulled on my laces, was: I wish I had a bedpost to hold onto! And it’s true. 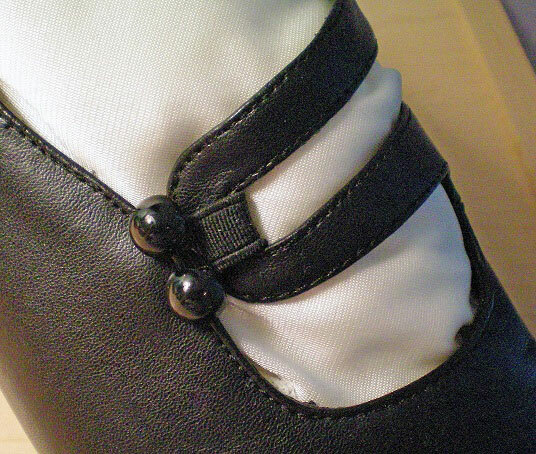 The person lacing the corset must do a lot of tugging to get the laces snug, and it can jerk you about if you’re not firmly planted. Next, I stepped into my bustle and petticoats; Em tied the ones that had drawstrings and hooked the ones that had hooks and eyes. 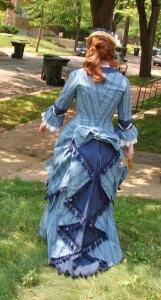 I wore the antique petticoat first, as a modesty garment. It was narrow and covered with lace. Over this came the bustle, which was built into a second petticoat, a plain one that had tiers of ruffles down the back to hide the shape of the wire hoops. The third petticoat fit over the bustle. 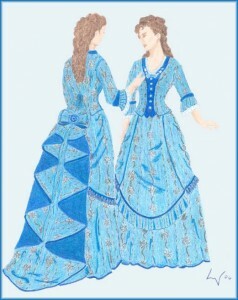 It was very full, with an embroidered ruffle around the hem. My skirt came next, over my head. I shrugged into the bodice, and Em helped with all the hooks down the front. You certainly get to be on intimate terms with your dresser! I can imagine that a certain chemistry would have been necessary between a wealthy woman and her lady’s maid, and it would have helped cement a bond between sisters who lived together and helped each other dress. I could have done all this myself, of course, but I would have required a full-length mirror, and it would have taken more time. It was definitely easier to have help. Finally, I stood dressed and ready to go . . . save for my hair. I had a little hat, some hairpins, a hatpin, and a clip-on hairpiece that matched my hair color. This was one area in which I felt utterly helpless, so Em stepped up and styled my hair into a fair approximation of a Victorian coiffure. What I found most interesting is that she took a top section of hair and twisted it into a small knot with which to anchor my hat. Without it, my hatpin would have had nowhere to go and my hat would never have stayed in place. 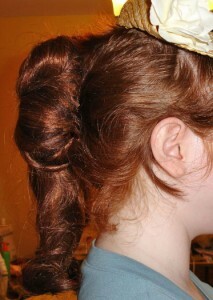 The hairstyle was simple: a layered knot, and a long section of hair that fell from the side of the twist. My bangs were very un-Victorian, but we didn’t have the time to frizz them, as would have been stylish in the 1870s, and they refused to stay combed to the sides. Because I had short, layered hair, it refused to stay perfectly coiffed, and I’m afraid rather a lot of it came down in wisps around my head. Still, Em did her best with what she had to work with. 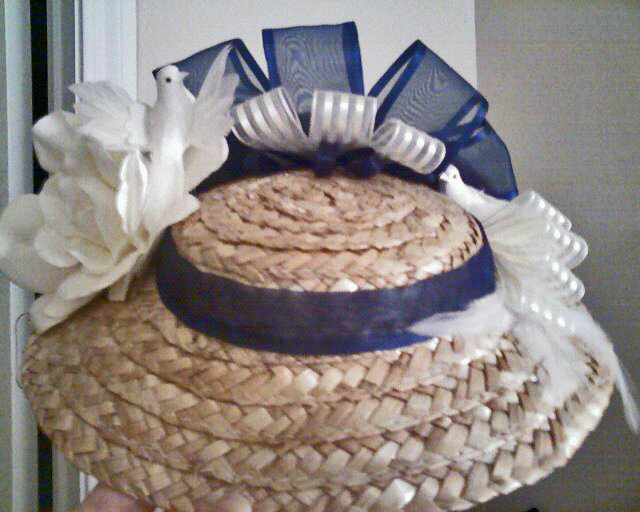 My hat perched on top, a little concoction of straw, with looped ribbons, feathers, flowers, and two tiny stuffed birds. Em refused my offer to help her get dressed. She’s done it so many times as to be an expert. Any aid on my part would only have slowed her down! She clipped a braided bun over her ponytail, and at last we were both coiffed and hatted. We trotted out the door, our skirts trailing behind us. The first thing I learned about the reality of wearing a bustle and corset in public is how terribly inconvenient it is to get in and out of the car. As I found out another time, it’s somewhat easier to sit in a high seat, as in a van or SUV, instead of the low seat of a sedan. It’s also easier to get in and out of a front “bucket” seat, but this time I was seated in the rear “bench” seat of the car. To get in, I had to put one foot in the car, duck my head inside, and then artfully collapse onto the seat. Getting out again proved impossible without a helping hand. Score one for chivalry! We walked around a small mid-town area and eventually found our way to a deli for lunch. I discovered that I couldn’t hold the door open, pass through it, and manage my train all at the same time. If I let go of either, my skirt would end up trapped in the door . . . thus, I really did need a gentleman to hold the door for me. Score two for chivalry! Once we had ordered our food and found our table, I soon learned another valuable lesson: it’s quite impossible to sit down and slide your chair up to the table while wearing a wire bustle and several layers of petticoats. I’m not sure what prevented it, exactly, but I tried and it simply didn’t happen. I needed someone to slide my chair in for me as I sat. The man who took our orders came out from behind the counter to oblige. Score three for chivalry! We ate a light lunch, did some shopping at an antique garment shop—where I happened to find a pair of vintage gloves that matched my dress perfectly—and then returned to Em’s house. There, I made another discovery. When the experts recommend that you wear your corset for a half hour around the house and then tighten it before you dress . . . take the advice and do so. As I’d worn my corset on our little adventure, it had loosened, just a little, but enough that the hooks on my dress had begun to strain. As a result, my bodice is gaping in all the photographs we took that day. How did I fare in the muggy heat? Surprisingly well. The many layers of cotton did their job and kept me somewhat cool. The humidity was worst than the heat itself, by far. All the same, it was quite a relief to peel out of my petticoats at the end of the day. To my surprise, I found that my combination was utterly damp. I’d perspired into it—and it had done its historically advertised job of absorbing my sweat, and as a result, had kept my corset from getting ruined! All in all, it was a valuable experience. I learned a lot that day, and had a fantastic time in the process. Most intriguing, I discovered the true purpose of chivalry—to assist a woman who might have difficulty doing certain things for herself. It’s no wonder common courtesy has all but died out, when women no longer have such mobility restrictions. And yet, even though I had trouble passing through a door and seating myself at the table, I was able to move in ways that I hadn’t thought possible. Most notably, the hoops of my bustle collapsed when I sat, so I was not obliged to perch on the edge of the seat as some period paintings depict. 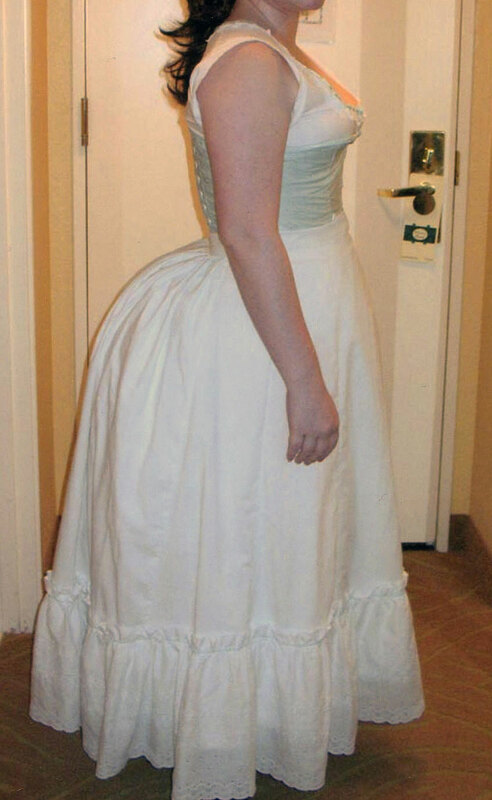 I was only slightly bound by the boning of my corset, and was able to kneel, sit, stand, and move about with little difficulty, and of course, with impeccable posture. The biggest worry I had was the fear of wrinkling all the layers of my skirt when I sat. It’s hard to spend so many hours creating a complex garment full of pleats and ruffles and draperies, and then know without a doubt that you’re crushing every single one of those precious pleats! Surprisingly, however, the draperies did not wrinkle as badly as I’d feared. Most of the creases shook out when I stood, and the rest were not noticeable. In conclusion, I had a wonderful time. I gained so much knowledge about the art of historic costume, and how to make it work in a modern-day world. Given the chance, I’d do it again in a heartbeat. In fact, I had the opportunity to wear this costume one other time—to a performance of The Phantom of the Opera, in Birmingham, Alabama. We had front row seats, and because of that—I got noticed. Some pretty amazing things happened as a result, but that’s a story for another article! Have you dressed up in full historic costume and gone out on the town? What limitations did you discover or debunk? Yes, many times. I’m a former Revolutionary War re-enactor. I’ve seldom done it alone, although I did one time in New York City. New York being New York, very few people stared. 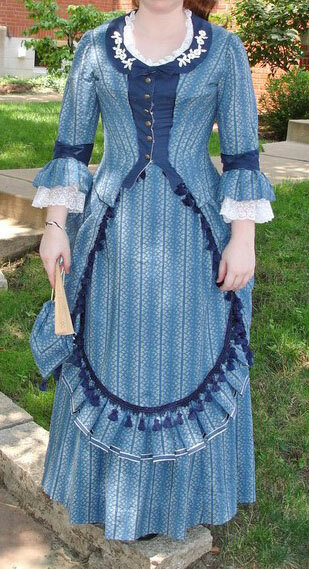 Going camping in period corsetry and shoes was not difficult. 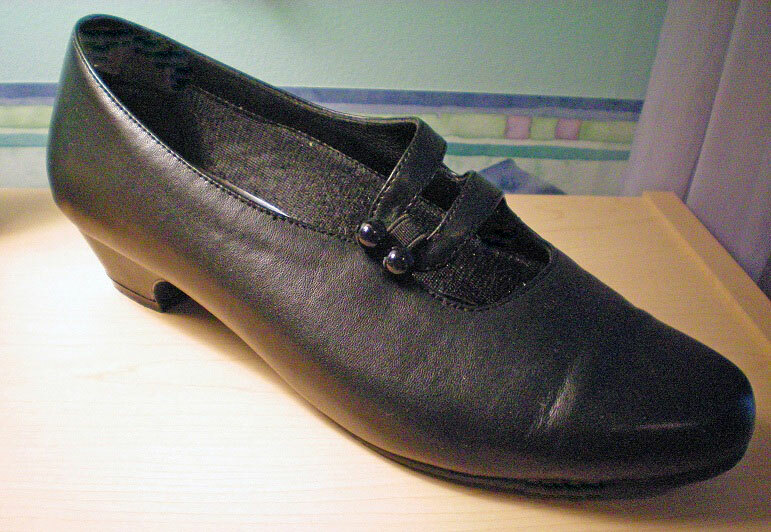 I even learned to lace a pair of French stays by myself. The whole rig was not uncomfortable most of the time, even in summer heat. The only occasion I recall when it was was one 90 plus day on Long Island with very high humidity when we were working on Alan Alda’s Sweet Liberty. Ooh, now going camping in full costume would be interesting! I have a hard enough time camping in regular clothes, not sure how I’d do with a corset and petticoats. Would be fun to try, though!